Egypt's prosecutor has referred a female writer to trial for allegedly insulting Islam by criticizing the slaughter of animals during a major religious festival, a judicial official said on Saturday. 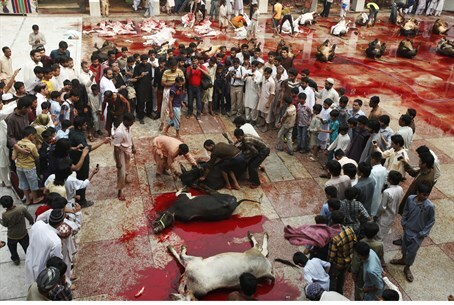 Animals are slaughtered during Eid to commemorate the willingness of Abraham to fulfill God's command to sacrifice his own son, although in the end God provided him with a sheep. Unlike in the original Biblical story, the Koran's version sees Abraham willing to sacrifice Ishmael, not Yitzhak. "Massacre committed by men over the past 10 centuries and followed by men each year with a smile," Naoot wrote at the time. "Annual massacre observed because of a nightmare of one (prophet) about his son... ," she wrote in Arabic. "Although the nightmare has passed for the prophet and his son, each year helpless animals pay with their lives the price of this sacred nightmare." "It is the price paid by those who carry torches of enlightenment at every age," Naoot wrote on Friday after having been informed of her trial which is due to start on January 28. Egypt's constitution outlaws insults against the three monotheist religions recognized by the state - Islam, Christianity and Judaism. But despite that supposed nod to diversity, non-Muslims in Egypt face rampant discrimination and attacks. The Jewish community today comprises of just a few dozen individuals after most Jews were driven out in a campaign of ethnic-cleansing in revenge for the establishment of the State of Israel. And Christians - including the indigenous Coptic community, which makes up some 10% of the Egyptian population - have long complained of discrimination in the Muslim-majority state. They have also been targeted in several deadly attacks - a terrorist campaign which escalated since the ouster of Hosni Mubarak in 2011. But though attacks against Christians by Muslim extremists have lessened since current President Abdel Fattah al-Sisi took power, discrimination against both them and secular Muslims remains an issue.